Theme An absurd, lighthearted take on the heist genre. With bears. Flavour Honey-flavored, obviously, with a side of crime. The Heist This is it. The Big Heist. The job that could make or break your career. Maybe you'd promised yourself you'd given up the thieving lifestyle. Maybe you never left it. Or maybe this is your first foray into the world of crime. Whatever your history, you were no match for the irresistible siren song of a good payday, and now you find yourself as part of an elite team of fellow thieves, all hungering for a taste of sweet, sweet victory. Because you're a bear. Or possibly a honey badger. Did I forget to mention that part? Yes, you are a bear. You and your highly skilled (by bear standards, anyway) team of fellow bears (and honey badgers) have been hand-selected (paw-selected?) to infiltrate HONEY-CON 2019, the most prestigious human-organized gathering of honey producers and aficionados this side of the Rocky Mountains (neat! Well, except for all the humans). With product showcases, competitions and tastings, the event will be stockpiling enough honey to keep a bear fed for years. Plus, this year's convention is being hosted by famed eccentric beekeeper Mellifera Honeybottle and will feature an exhibition of her patented Ultima-Honey, a super-dense mega-honey produced by her own strain of unnaturally fancy bees (seriously, I heard they're born with elbow-length gloves and tiaras). Not only is it rumored to be the most delicious honey on the planet, but a single spoonful sells for millions on the bear black market (yes, the bear black market exists and yes, it operates on salmon and berries). A bear could live like royalty for years on that kinda payday. This ain't gonna be a walk in Jellystone Park, though. Honeybottle has a vendetta against bears (something about losing one of her childhood bee hives to a grizzly?) and security is gonna be tight. HONEYCON 2019 is being held in the high-end mountain retreat Chateau Pretentieux, a ski lodge and resort for the rich and famous. Human security is everywhere, and you don't have opposable thumbs or the ability to speak fluent Human. You've got your work cut out for you. Your mission: To pull off the greatest heist bearkind has ever known. Grab the honey, get the Ultima-Honey if you can, and get out. Welcome to Honey Heist, the free, 2-page rules-light rpg written by Grant Howitt where players take on the roles of ursine criminal masterminds! The rules page for player characters can be found here. 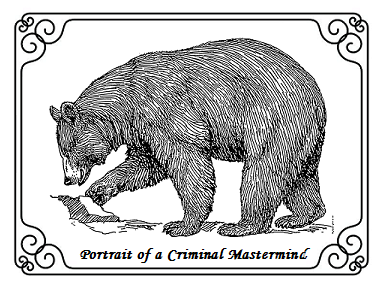 Honey Heist is a D6 system where players have only 2 stats: Bear and Criminal. To succeed at a given task, you need to roll lower than the associated stat score. For example, if you want to try and scare off a security guard with a mighty roar, the GM might have you make a Bear roll. If you have a current Bear score of 4, then you need to roll a 4 or less on the die. Everyone starts with 3 points in each stat, but those points can shift back and forth between the stats as you succeed or fail throughout the game. Be careful, though: If you get a total of 6 points in a single stat, your character either goes feral (max Bear stat) or slips into a greed-fueled life of crime and backstabbery (max Criminal stat)! And that's bad! It's a fun, silly game that's not meant to be taken too seriously. This will be my first attempt at playing this game, so newcomers and seasoned players alike are welcome! We'll learn and fail together. If you want to watch a game to see how it works, there are several floating around on Youtube, including a very entertaining trilogy of episodes from Critical Role. There is no way I can make a game that entertaining, though, so don't set your expectations too high. This will likely be a relatively short game by Play by Post standards-- the system is designed for one-shots rather than lengthy campaigns, so it has the potential to be completed within a few months. 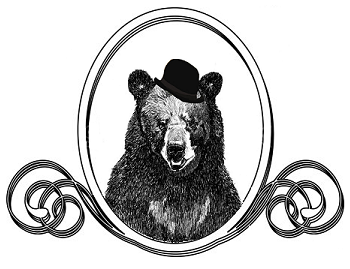 NAME: What name will go into the bear history books if you succeed, or into the bear obituaries if you fail? DESCRIPTOR, BEAR TYPE AND ROLE: Pick one option from each of the following three tables (or roll a d6 for each if you feel so inclined). Your role and bear type will give you advantage on dice rolls when you try to do something associated with that skill. For example, a polar bear has advantage on any attempts to swim, and a thief might have advantage on picking a lock. Your descriptor is just there for flavor. HAT: It does nothing, but it looks cool, and really, isn't that all that matters in the end? Choose one or roll a d8 to let fate decide for you. 8. Roll twice, take 2 hats! BEAROGRAPHY: ...it's like a biography, but for bears. Give me a brief summary about your character. Who are you? Where did you come from? What drew you into this life of crime? Do you have any distinguishing features that will go on your Wanted poster? RP SAMPLE: You have been specially selected for this mission by an unknown benefactor. Maybe your reputation precedes you. Maybe you owe someone some serious dough and will jump at any opportunity for some work. Maybe you've been vetted by another professional. However it happened, you were lucky (or unlucky) enough to receive an invitation to learn about "a fantastic business opportunity" from "someone with your best interests in mind." You are told to meet at an old abandoned truck stop off a Colorado highway on the night of the full moon for more details. Be there or be bear. Or both, really. Write me an RP sample about your character receiving this message. The form of the message and messenger are up to you to decide! Addenda I will be selecting a team of between 4 and 6 characters. Applications will close on April 30th. Questions? Comments? Bear puns? Post 'em here! Last edited by Pseudonymous; 04-07-2019 at 05:12 PM. Bearography: Life as a bear ain't always what it's cracked up to be - sure we look sweet and junk on those videos people take of us playing in trash and sitting at their tables but we just want to be included! We're smart! They just never give us the time of day to show them what with their fancy clothes and opposable thumbs! His head lurched forward and his snout hit the horn causing it to give out its brief weak honk before it died, not even close to the sound of the crash he just got into. Letting out a low groan and trying to rub his nose Edwin looked over the dash and out the shattered window that has been broke since the start of the week. Where did this fire hydrant come from? He tried to shift the car into reverse but all he heard was the dull clank of the gears shifting but the engine wasn't responding. As a matter of fact, didn't he hear some odd sputters before he hit the hydrant? Damn, it was time for a new car again. These things never lasted more than a week it seemed before they sputtered out and wouldn't move any more. Fumbling a bit he managed to open the door and roll out of the vehicle onto the warm pavement. Letting out a sigh he looked up at the blue sky "Good-bye Ester" he simply said before rolling over and getting up onto his paws. He had a bad habbit of naming every car he drove, despite them never lasting long. If only he could figure out how the humans make them not sputter out so soon! He was pretty good at driving, he just couldn't figure out that one If it hasn't been obvious yet - its putting gas in the car trick! Making his way towards the treeline he heard a few fluttering of small wings before everything went dark. "'ey! Who turned out the sun?!" Edwin questioned sitting on his rear and felt his head. His favorite flat-cap that he found in an old taxi was pushed down over his face. As he pulled it back up he heard the flapping of wings once more. Now that he could see again he looked down to see a mountain bluebird sitting there with its head darting to and fro impatiently. "uhh...hi"
"Nice crash there budDY!!" the bird chirped with its voice raising almost into a yell near the end causing Edwin to recoil. What the heck was wrong with this thing? Upon closer inspection he saw one of its eyes twitching without pause and most of the feathers on its body and wings looked grimy and darkened. Did this thing bath in soda?! "shame you broke another car, YEAH?!" "Uh, yeah. I'll just find another, though." the bear said trying to move around the bird but it quickly scurried back in front of him still twitching. "Look...twitchy. I'm going to need you to-"
"Yes, but why must you yell?" he said in an almost pleading voice to the bird. The bird ruffled its feathers ignoring him completely. "Then go to the truck stop off the highway on the full moon -OR ELSE!" Edwin wondered how caffeinated bird tasted. He's never really had the opportunity to eat a bird alive. "Fine! Fine! Just stop yelling! Please!" As the final word left his maw the bird took off into the air like a dart hitting a tree trunk and falling into some bushes. It was dead wasn't it? Well, maybe he would finally be able to try caffeinated bird? Before he could ponder any further it burst from the bushes and fluttered off into the sky. Letting out what was bearly a sigh and more of a whine he started on his way towards the truck stop. I don't have time, so I'm not applying, but I do want to applaud your choice of what is sure to be a delightfully bear-pun filled game. It will likely feature an unbearable amount of puns. Pure pandamonium. Many grizzly details. I might want to watch this one. Kudos to Pseudo for working on something unorthodox! A veteran of many such endeavors here--with a frankly modest track record--I love seeing new stuff. And the rules are awesomely concise. Here's my application. ...ten years ago, anyway. Today Danny's twenty years old, definitely in bear middle age, near-broke and flabby. He can't climb his way out of a bottle of cheap imported "Just Like Honey" brand mead. He knows it's food coloring and corn syrup boosted with grain spirits, but still...after a few throat-searing swigs, Danny's on top of the world again, carousing with his crew after their latest apiary assault. 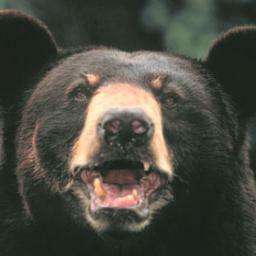 (Below: Danny Ursine, former George Clooney of the bear heist world...here seen on a typical day. "Well, if it isn't Danny Ursine. The once-sort-of-great. Ish." The drawl came slow as honey in January and just as sweet. I knew the voice, of course. I lifted my head off the bar and started blinking. I didn't need the dim fluorescent overheads, which buzzed with the hum of a thousand zombie bees, to show me the speaker, though. I tried to sit up a little straighter. Well, straight, anyway. My head pounded like a circus bear was playing Kashmir on a bongo made of my skull. "Hey there, Tess. How's life among the rich, famous and un-bearably fabulous?" Yukon Tess. We had a thing, her and me, and it was a good thing, while it lasted. They said it wouldn't last, that a grizzly and a black would never make it work, but we showed them, at least for a few years. She was my Kodiak moment. "Life's good, Danny. Too bad you never figured out that I was the most important thing in yours." Her enormous muscles and towering physique took my breath away--or maybe that was the last of my case of Bear Flu--but as always, it was her beady black eyes and reckless, alarmingly toothy grin that still kept their hold on my heart. "Yeah, well..." I'm known for my quick wit and surefire comebacks. She looked down at me. "Listen. I'm just passing through. On my way to a pretty big gig. Someone I know mentioned a thing to me. I thought of you. Wasn't hard to find you, on account of there's only the one bar in this koala-hole town." I batted a few empties around between my paws. They rolled around on the once-shiny, once-smooth bar like empty beehives made of brown glass. Sad and dark containers that once held something sweet--until life drained them dry. "A thing?" "Yeah Danny. Could be a good thing." She looked at me intently. "If you can get your urse off that barstool long enough to head over to the old truck stop on the Colorado Highway. Full moon. Day after tomorrow." She patted my shoulder and turned away. I watched her go. Again. "Thanks, kid," I called out. She paused by the door, looked over her huge, hairy shoulder, nodded once, and walked out of my life once more. I groped for my trilby, found it when I smushed it on the cheap, stained wooden bar, and mashed on my head. It sat on top of the flat cap that I'd never been able to un-wedge from between my ears. Maybe this was it. Maybe I was gonna catch a break...one last break...and then she'd take me back. Again. Apps are looking grrrreat so far!! Ooooo! Wanna play! This seemed like such great fun when I saw it played on stream! Place holder please? Does it matter where we role for our possible roles? Should we role for bear type? You're welcome to pick or roll for any of the stats you like. If you want to roll for some stats and manually choose others, that's fine too. This being the case, I'll allow dice rolling in this thread. I'm just posting extreme interest! Will try to get a full application up later today. It's something my forebears would be proud to see me do. BEAROGRAPHY: Emperor Min-Ye (pronounced "Many") Chin was born in the Purple-- a purple operating room in a zoo, where he has spent most of his life. Day in and day out, Min-Ye was fed Bamboo, honey, and virtually anything else that his heart desired, so long as he lumbered around performing for the zoos many visitors. Min-Ye grew fat on his constant stream of delicious goodies-- until, that is, Zoo funding was cut. The Panda bear at first scoffed at his clear mistreatment. After three terrible days of slightly-reduced food offerings, Min-Ye lumbered over to the door just as the feeding crew was coming out. Holding his Bamboo scepter, he tried to force his servants to kneel by thwapping them on the head. Unfortunately, it killed each of them. Believing that the men were simply bowing in extreme shame, Min-Ye Chin walked out into the zoo in search of food. He only found some when he came to a wonderful, magical land called "Burger King." All fled in terror before their god-emperor Panda, and he was welcome to ransack the food stores, using his Bamboo Walking Stick to reach high places. Min-Ye was lucky enough to leave before Animal Control arrived, and has spent his days wandering the landscape, eating anything vaguely Bamboo-Shaped (except his treasured Bamboo Staff / Emergency Snack), finding other Bears to break into restaurants with. "It's a real shame, you know, that the humans decided to get uppity! Way better when they knew their place, you see," Min-Ye Chin explained through wiggling, hair-covered jowls. "Why, back in the olden times, I needed only give a mighty roar, and they would bring me whatever my heart desired! A pot of honey. A plate of roasted bamboo garnished with garlic. A tourist. Anything I desired!" He adjusted his crown as he spoke, ensuring that it was properly placed. 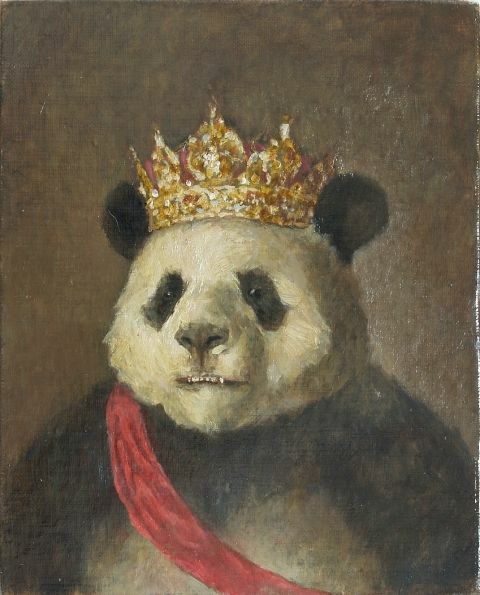 His first crown had come from Burger-King, a fitting tribute for the freshly escaped bear. But he had somehow come into possession of a real crown in the intervening months. "Buuuut, then they got it in their tiny heads that they did not owe me fealty-- US, fealty, really. 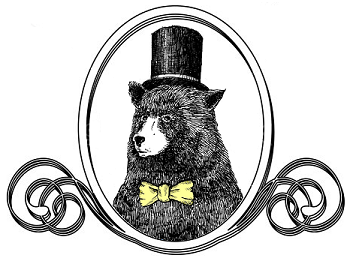 After all, we bears are all of royal blood, made better than the pink-bellies." 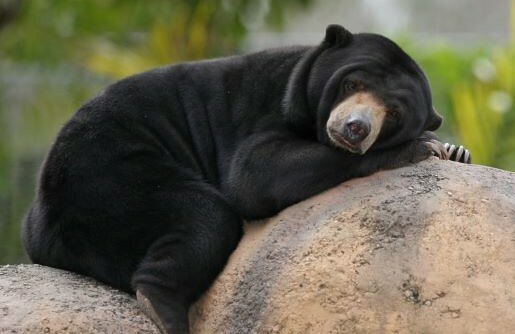 Min-Ye nodded in affirmation to his Black-Bear companions, who rolled their eyes in response. "Yeeessss, yes, fine. I'll do the heavy lifting, little ones. But don't you forget what your good friend, Min-Ye does for you. After all, I know of an even better heist we could pull in a few months. Honey like you wouldn't believe! Golden as the Sun's Dawn! More beautiful than the crown atop my head! As delectable as--" Min-Ye was cut short as a stockroom door opened behind the trio, and someone gasped in terror. Min-Ye turned around to observe the intruder. A young man, no older than 14. "Ah, poor peasant boy. You have come here at the wrong time. Now, I must embrace you..."
Of course, all the kid heard was "GRWAAURGH!!!!" as Min-Ye dropped the plastic honey-bottles and lumbered his flabby frame over to the child. Using his Bamboo Staff to trip the kid, Min-Ye then let his ungodly bear-body belly-flop down onto the horrified youngster. Behind him, Min-Ye suddenly heard bear-giggling. "Hahaha, thanks for the help, Minnie! We'll take the honey from here!" The two juveniles were escaping, all of the collected honey in their hands. Those impudent brats! How dare they! Insolent! Traitorous! Unbelievable! Min-Ye stood up, the frame of an unconscious Pink-bellied kid flattened against his enormous belly. Peeling the child away and leaving the shallow-breathing human on the Wal-mart floor, Min-Ye huffed. "WELL! See if I invite YOU to HONEYCON 2019..." he mumbled to himself. Last edited by Unko Talok; 04-12-2019 at 03:30 PM. My atrocious reputation precludes my awarding any RPXP. I have no such restrictions. Here's to you, Unko!